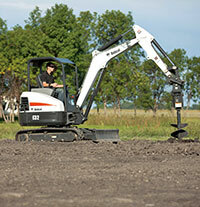 A popular model in the 3- to 4-ton size class, the 33.5-horsepower E32 compact excavator provides unmatched power, excelling in a variety of high-load conditions — due to class-leading multi-function cycle times. The Tier 4-compliant compact excavator features a non-DPF engine solution, first-class operator comfort and ample dig depth and reach. The E32 conventional-tail-swing compact excavator can perform well in tight spaces and under high-load conditions — and sustain travel speeds during pushing and climbing functions.